Sometime, on some shores, you can walk over to an island when the tide is low; if the tide is high, you take a boat. This is not one of those places. The Croa do Gore is a small tidal island, a sandbar, in the middle of the Vaza-Barris River. It disappears at high tide and is reborn at low tide. 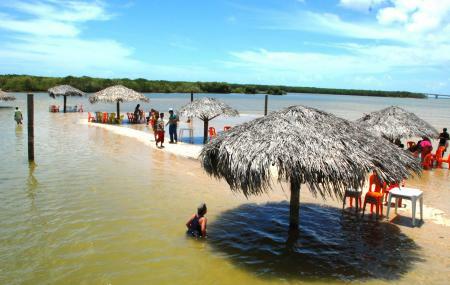 A boat from the nearby village of Mosqueiro, from the Sunset Rim area, will take you to its floating bar. And at its heart, that’s what this island is – an unusual bar-restaurant! The crab, the shrimp, and the fish broths are mouth-wateringly delicious. There are shaded tables and chairs. The prices are unexpectedly reasonable. Just one tip – bring nothing with you to take onto the island. It’s best to take this tour on with the help of a local travel agent who’ll know the logistics. Transportation to the island and back should cost you about USD85. It’s simple – the island is open when the tide is low, so check for low tides. Recommended timings: 10.00 am To 3.00 pm. Drive to Mosqueiro, and then take a boat/catamaran to the island. How popular is Croa Do Gore? People normally club together Saco Beach and Aruana Beach while planning their visit to Croa Do Gore.